We were joined in school today by Lama Rabsang, a Tibetan monk, who shared his life experiences and faith with Willow class as well as teaching them some meditation. It was very interesting to listen to Lama and learn about differences between our cultures and faiths. Thank you to Sue from SportsReach who lead our worship this morning. The children has great fun trying out their shooting skills. SportsReach use football and netball in a variety of ways to spread the message of Jesus Christ all over the world. We joined today in our worship by Roger Mason and Tom Pendlebury from Garstang and Over Wyre Rotary Club. They presented school with a very generous cheque of £5000. This is to support school following the December floods. School are very grateful for such a generous donation and are going to use the money to improve the school library and ICT facilities. Work to the current ICT suite is being carried out over the summer holidays, so watch this space to see our refurbished room! We welcomed two members of the Lancashire Fire Brigade to educate our Year 2 and Year 6 pupils on the dangers of Fire, and how we can protect our families to stay safe. Year 6 enjoyed using the 'pebbles' completing an interactive Quiz. 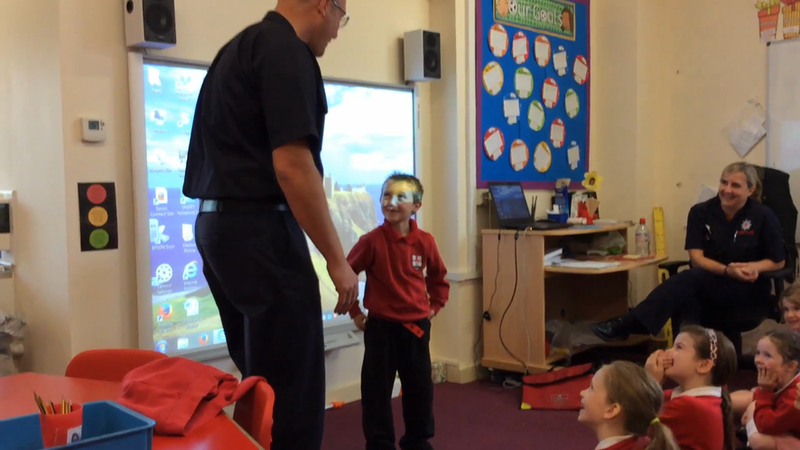 Year 2 watched an animated video and used role play to help them learn about what to do in the event of a fire. Year 2 learn how to 'stop, drop and roll'. Are we in the right order? The Simpson family is rescued! We welcomed Mrs. Tyson from Lancashire County Council into school to train Year 5 pupils on how to serve food correctly and hygienically, talking about temperature control and bacteria. Each child received a certificate and we are looking forward to them showing off their new skills when we start to use the hall as a shared dining room. We were delighted to welcome pupils from Cockerham C.E. Primary school to join in the training with us. We have had an exciting afternoon with Neville Norcross and Susan Watts from the Diocese for worship and music. We had great fun learning new songs with actions for our worship time. We enjoyed a lovely visit by Dr. Sam Johnson from the Diocese. Dr. Johnson joined us for worship, then took time to talk to staff and children about the December floods and how school has coped in the aftermath. He particularly enjoyed his discussion with some of our Class 4 children, whom he said were "all delightful and a real credit to the school." On Wednesday 4th May, we were delighted to welcome Fiona and her colleague from Waitrose. During December we were one of the local organisations nominated for their token scheme. We were privileged to receive a cheque for £500.